Three stains found on the brown sports jacket seized from Dennis Oland's home tested positive for blood, and the DNA found within those bloodstains matched his father Richard Oland's DNA profile, the accused's murder trial heard on Tuesday. 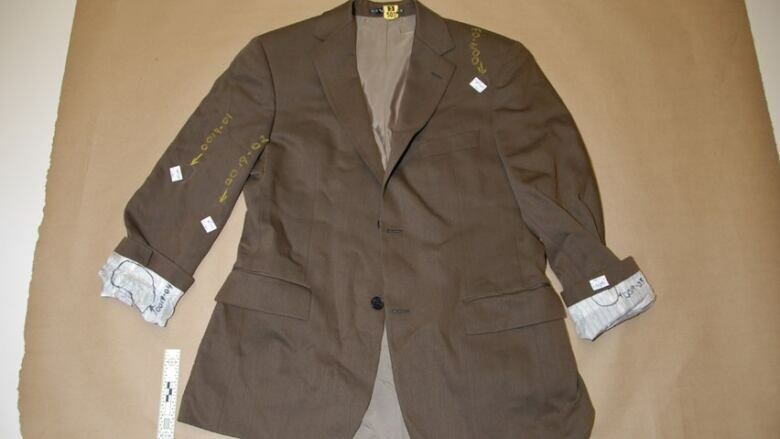 Three stains found on the brown sports jacket seized from Dennis Oland's home tested positive for blood, and the DNA found within those bloodstains matched his father Richard Oland's DNA profile, the accused's murder trial in Saint John heard on Tuesday. 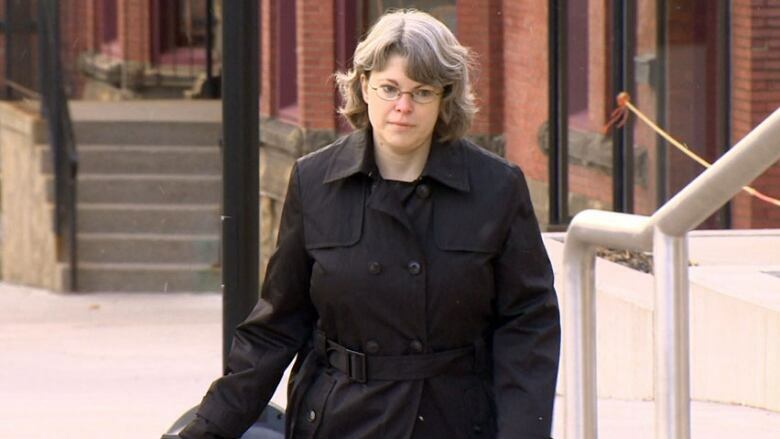 Joy Kearsey, a DNA scientist who worked for the RCMP's forensic lab in Halifax, analyzed several samples related to the 2011 death of the prominent businessman and testified about her 1,400 pages of findings, which were reduced into a 52-page report for the jury. Blood was confirmed in three areas of the Hugo Boss jacket seized from Dennis Oland's bedroom closet a week after his father's bludgeoned body was discovered — the outside right sleeve, the outside upper left chest, and the outside back, in the centre, near the hem, said Kearsey. Within all three of those bloodstains, she found single-source DNA profiles that matched Richard Oland's in all nine areas used for comparison. DNA scientist Joy Kearsey worked at the RCMP forensic lab in Halifax in 2011 and conducted tests on some of the samples related to the Richard Oland case. (CBC)"The estimated probability of selecting an unrelated individual at random from the Canadian Caucasian population with the same profile is one in 510 billion," Kearsey said under questioning by Crown prosecutor Patrick Wilbur. The world population is estimated as being between seven and eight billion. There's no way to say how the blood got on the jacket, or how long it had been there, said Kearsey. But it is "likely" the DNA extracted from the bloodstained areas came from the blood, she said. 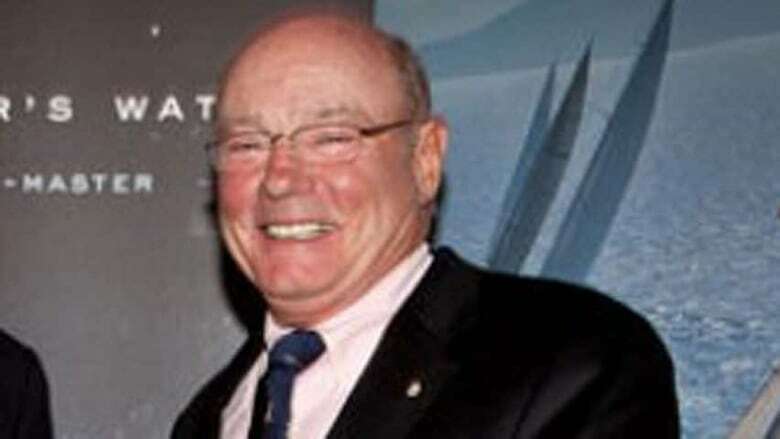 The body of Richard Oland, 69, was discovered lying face down in a pool of blood in his Saint John investment firm office on July 7, 2011, with "hundreds" of blood-spatter stains around him. The multimillionaire had suffered 45 blunt and sharp force injuries to his head, neck and hands. Richard Oland, 69, was found dead in his Saint John office on July 7, 2011. (Canadian Yachting Association)Dennis Oland, 47, who was the last known person to see his father alive during a meeting at his Canterbury Street office the night before, has pleaded not guilty to second-degree murder and is standing trial before a judge and jury in the Court of Queen's Bench. Oland told police during a voluntary statement on July 7 he was wearing a navy blazer when he visited his father on the night in question, but security video of him earlier that day shows he was wearing a brown jacket. Maureen Adamson, Richard Oland's secretary, also testified to seeing the accused in a brown jacket when he arrived at the office. The jacket was dry cleaned on July 8, after police told Oland that he was a suspect, the trial has heard. Defence lawyer Alan Gold, who's known for his expertise in dealing with forensic evidence, argued there's no way to say conclusively that the DNA found came from blood. He said it's possible the blood was so degraded that the DNA didn't come from it, but rather another source, such as saliva, perspiration or tears. RCMP Sgt. Brian Wentzell found four areas of staining on the brown sports jacket seized from Dennis Oland's bedroom closet. (Court exhibit)He even suggested it could be animal blood and the human DNA came from another source, noting DNA can be transferred by touch and some people are "good shedders," who leave behind more DNA than others. DNA can also "migrate," depending on how an item is packaged, said Gold. The jacket in question was folded up and stored in a paper exhibit bag that measured 30 centimetres by 30 centimetres for about four months, so some parts would have come into contact with other parts, he said. Kearsey agreed there was no way to say for sure what the source of the DNA was, but maintained it was "more likely" it came from the blood, based on her experience and knowledge of how the process works. "I can't put a percentage or anything on it," she said. There was no indication of any animal DNA, she added. Gold stressed how small the bloodstains were. The one on the back, for example, measured 0.5 centimetres by 0.5 centimetres and was overlooked the first few times the jacket was examined by at least two people, he said. The blood "could have been on the jacket for weeks or months," said Gold. Kearsey agreed there was no way to know the age of the blood, but she said she would expect some would be removed every time the jacket was cleaned, depending on the thoroughness of the laundering or dry cleaning. Kearsey testified on Monday the two tests used for the identification of blood can produce false negative results if "environmental insults" have degraded the hemoglobin. Washing an item, for example, or warm and moist environments can create false negatives, she said. 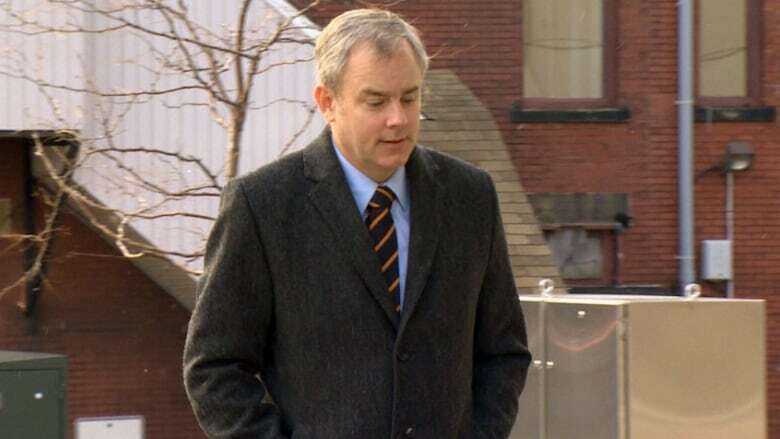 Some of the stains on Dennis Oland's jacket tested negative for blood and did not provide enough genetic material to provide a meaningful DNA profile, the court heard on Tuesday. A minimum of 0.246 nanograms, a billionth of a gram, is required. Two other stains found on the inside right cuff of the jacket tested negative for blood and had a mixed DNA profile, with the major component matching the victim's profile with a certainty of one in 180 million, said Kearsey. Another stain found on the inside left cuff also tested negative for blood and had a mixed DNA profile. In that case, the minor component matched the victim's with a probability of one in 40, she said. The trial resumes on Wednesday at 9:30 a.m., when the Crown is expected to call its final witness. Then the defence is expected to present its case. The trial, which started on Sept. 16, is scheduled to run until Dec. 18, making it one of the longest criminal trials in New Brunswick history.